Here are a couple of snapshots taken from DeLaval's business presentation for its milking rotaries, the TURN-STYLES™ PR1100 and PR2100. 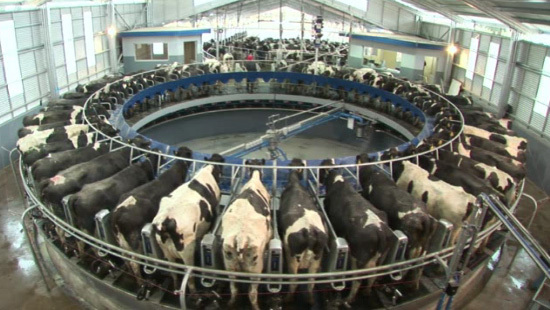 During the brief seconds when the camera locks in on the “parlours” as they slowly twirl about their bovine passengers, industrial food production is transformed (un)expectedly into a Busby Berkeley musical number. In their precisely calibrated choreography, these elegantly designed machines are undeniably mesmerizing. Singularities subsumed by symmetry and repetition, merged wholly into a patterned geometry. Frolic and hypnotic spectacle together side by side with cooly modernist efficiency. And though the rotaries do not appear to conflict with Cartesian topography, any sense of site and context can be nullified if you ignore the spoken and textual commentaries in the videos. But perhaps they can still defy gravity. Rotate them fast enough and they will detach, a gyroscopic whirligig on its way to a dairy farm halfway across the world. With cows still on board. Or better yet, for one week each year, the cows are replaced by these bloggers plus Kazys Varnelis, who are herded daily and singly into the compartments to blog whatever they want to write about while they are turned and “pampered” until they are returned exactly one hour later. And for anyone who did not produce an interesting post by the deadline, the abattoir awaits. Such is the brutal nature of the blogosphere. it's amazing the absurd level of cruelty humans are capable when they consider animals to be commodities. i like milk and cow meat. It makes me think about those rides at the carnival, where you're spun around, standing upright, and when you're going fast enough the floor drops out from underneath. Then I think about cow poop. I have to admit I have never heard of rotary farming before. Though the DeLaval videos mention that the rotaries have been around since at least the 60s, it's not entirely surprising to hear that a lot of people haven't heard about it before, because many agricultural practices are hidden from consumers. How many people have actually gone to a ranch? How about a slaughterhouse? Do most people actually know where, for instance, their apples come from? New England? California? China? Zimbabwe? The pig, which was ressurected into your moo shoo pork: did it ever see the light of day or did it pass its entire lifespan under an incandescent simulated sun? And was that pineapple really grown in Hawaii or by some enterprising Greenlanders? And this detachment isn't simply an infrastructural matter (i.e., you live in the city and the farms are "out there") but also because most don't bother or don't want to subject themselves to the savagery of the slaughterhouse. Out of sight and out of mind. It's the modern condition. So unless you grow all your foods or buy all of it from your local farmer's market and have a talk with the sellers about, among other things, where that tomato was grown, people will most likely remain clueless. And the number of the clueless will probably increase as the world grows ever more urbanized. In any case, I'm sure this issue is far more complex. And I'll keep a look out for other interesting farming methods. It's interesting how we have become so far removed from the ordinary everyday aspects of life such as butchering and farming, yet our demands have grown exponentially with the more "leisure" we have. Small wonder the planet is in so much trouble. Out of sight, out of mind, indeed. he stop blaming the Farmers. without them you guys would be dead. Blame The consumer( you folks ) wish to have a safe piece of meat for a low price. Well surprise surprise the only way we can do it is this way. we will built pigskyscrapers with cloned pigs to keep it cheap, the consumer eats anything. Veganism doesnt work, you do the math.stop reproducing yourselve might help. Unless I misread the comments, no one here is blaming the farmers of anything. But that doesn't mean that farmers are universally blameless and should be immune from criticism by default because they feed us all. glass abbatoires is the only way to solve it. how far we have come? (not). 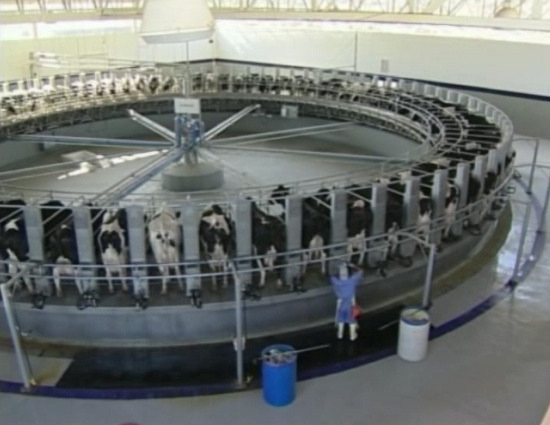 the image I see of cows on a circular spinning "assembly line" really does make a statement of how far us humans have stooped to industrialize what we eat. please look at this image and think about what the treatment of these animals says about us as a species. (personally I'm embarrassed to be human when I look at this).